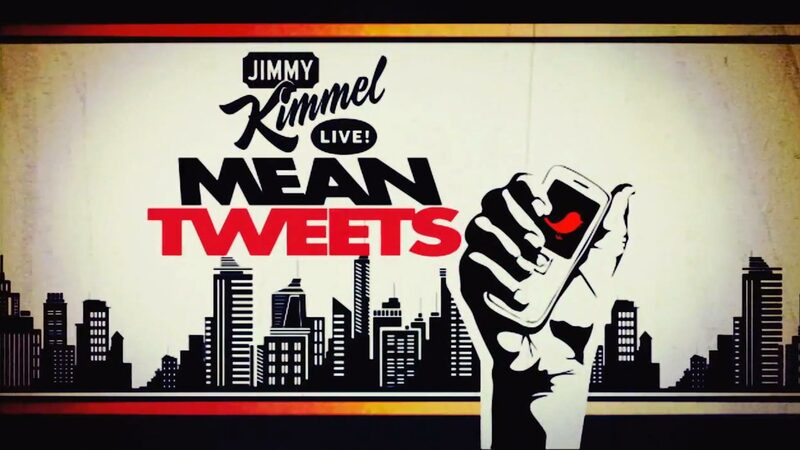 Jimmy Kimmel Live‘s “Celebrities Read Mean Tweets” series is reliably laugh-out-loud funny. P.S. It’s important to remember that everyone has feelings, and words can hurt. Hopefully these videos make people think twice before they post something awful. Julia Roberts @JuliaRoberts , Don Cheadle @IamDonCheadle , Ashton Kutcher @aplusk , Courteney Cox @CourteneyCox , Andy Garcia, Mindy Kaling @mindykaling , David Blaine @davidblaine , Don Rickles @DonRickles , Ethan Hawke @ethanhawke , Matthew McConaughey @McConaughey , June Squibb, Jeremy Piven @jeremypiven , Kit Harrington, Emma Stone, Gary Oldman and Sofia Vergara @SofiaVergara. Gwyneth Paltrow @GwynethPaltrow , Lena Dunham @lenadunham , Gerard Butler @GerardButler , Ty Burrell @TyBurrelI , Bob Newhart @BobNewhart , Britney Spears @britneyspears , Geena Davis @GDIGM , Chloe Grace Moretz @ChloeGMoretz, Chris Pratt @prattprattpratt , Scott Foley @scottkfoley , Michael Chiklis @MichaelChiklis , Ted Danson, John Stamos @JohnStamos , Lisa Kudrow @LisaKudrow and Adam Sandler @AdamSandler.